Isa is a rune associated with ice and winter itself, representing the icicle that will turn to water. Isa represents a forced stillness, a period of rest before activity, as in winter, there is nothing to do but wait for the ice to transform into water again. Therefore, Isa is the essence of Stillness, signifying a delay that may lead to a new start, or a call for inward focus (introspection) in contemplation and preparation. Another aspect of Isa which is also evoked by its nature as ice is that Isa can represent containment, as ice still holds the kinetic energy/movement of water within itself – as Isa only appears to be still. Related to this, Isa can be the layer of shimmering ice on the surface of a frozen lake that gives the illusion of stability and safety that only becomes treacherous if one should tread upon it without forethought and wisdom. As the final rune in Loki’s name, I believe that Isa represents the ice at the advent of creation, as Isa evokes His primordial nature as a Jotun, as Beings of transformative energy and the unity of opposites in nature. As well, Loki is a master of illusion, much like that frozen layer of ice on the surface of the lake; approaching Loki without wisdom and forethought can be treacherous. In conclusion, one may see in the runes of Loki’s name, there are the forces that oppose (fire and ice) that are the essence of creation. As an agent of change and transformation, perhaps these are the forces that Loki represents at Ragnarok: the chaos that brings balance, and the overwhelming change that damages then heals. 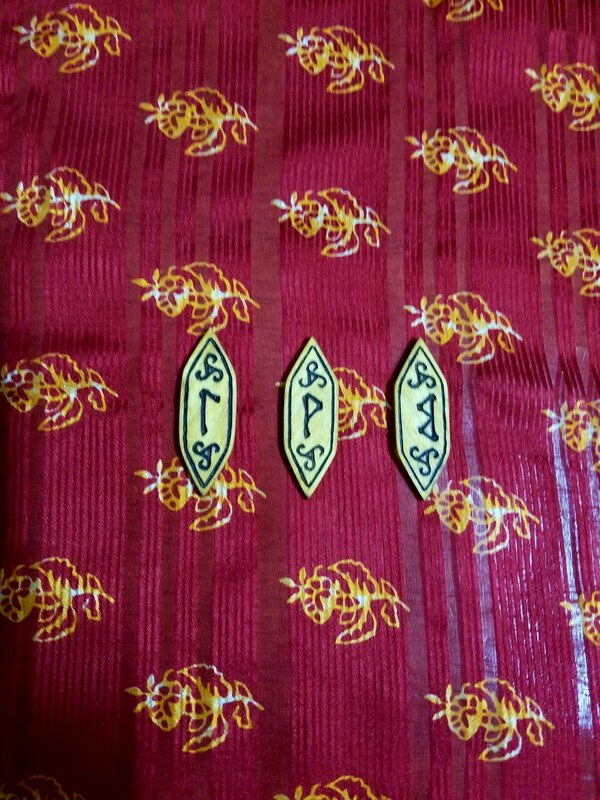 Three runes -Laguz, Kenaz, and Isa – represent the duality of the shapeshifting transformative forces of His energy and His nature – and perhaps these energies combine to strengthen, expose, and temper the concurrent forces of overwhelm, incineration, and damage that echo through Othala as the rune of ancestral knowledge and memory. The Elder Futhark rune, Kenaz is the torch, a rune of knowledge, teaching and learning. Inspiration and knowledge are often associated with light, as in “enlightenment” or “shedding light on the problem.” Kenaz is the act of bringing light, a force that makes the invisible visible, uncovering truth and bringing light to the unseen. In this sense, Kenaz is a rune that represents the flame of revelation. As well, Kenaz can also be interpreted as the flame that welcomes, the flame at the hearth, which is the fire which hallows (makes sacred) a space. In a similar way that Laguz is the flowing energy of water that must be controlled, so does Kenaz hold the powerful energy of fire – a force which is capable of being a beacon and a destroyer – as a welcoming fire could just as easily burn out of control if one becomes complacent about its power. Kenaz is a rune of sudden, rapid insight and discovery. Related to this meaning, the Anglo-Saxons interpreted this rune as Kaunen/Cen a rune that is not only the essence of the torch’s flame that illuminates the shadows, but a rune that symbolizes an ulcer, boil or wound. In that sense, this rune the heat of a fever, the mark of an illness that can easily lead to death, or metaphorically, the frenzy that can be brought on by sudden revelations that leads to delusion and/or madness. Though many scholars may disagree with me, as a rune in Loki’s name, I interpret Kenaz as evoking Loki’s energetic association with fire. Kenaz is the light of knowledge, the force that illuminates the shadows, and the symbol of the welcoming hearth-fire at the center of the home. As well, I see the relation to Loki’s energy in both the Elder Futhark and Anglo-Saxon runic forms: as the Kenaz rune echoes the energetic duality as fire as a provider and destroyer similar to the rune Laguz’s duality of water – and as Kaunen, the rune that symbolizes the boil/ulcer, the fevered mark of an illness – the fever that needs to break before one can be healed, or the damage that must be attended to, as Kaunen is both the warning and the reminder that must be heeded to avoid death/disaster. 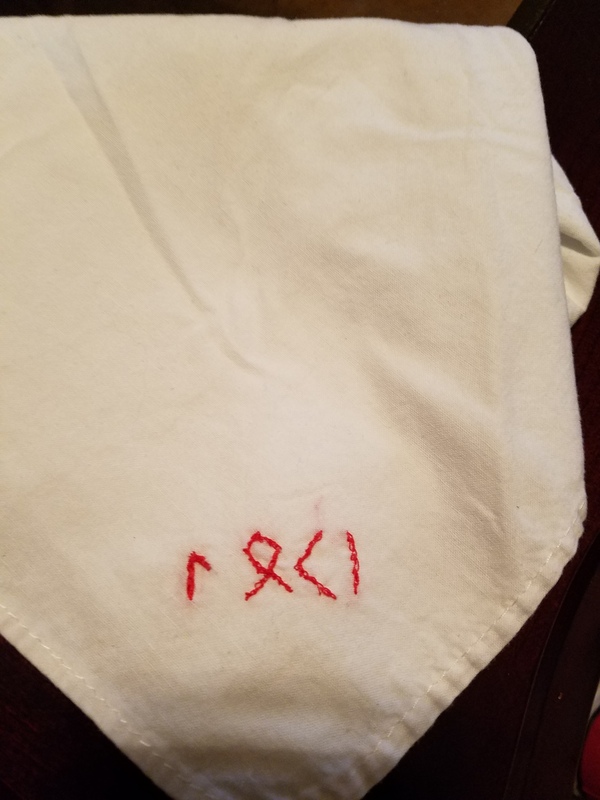 Aside from the strange (but perhaps not so surprising) difficulty that I experienced in the process of embroidering this cloth, I do remember that as a time when the meaning of the runes themselves confused me…as I had only begun to learn their mysteries. 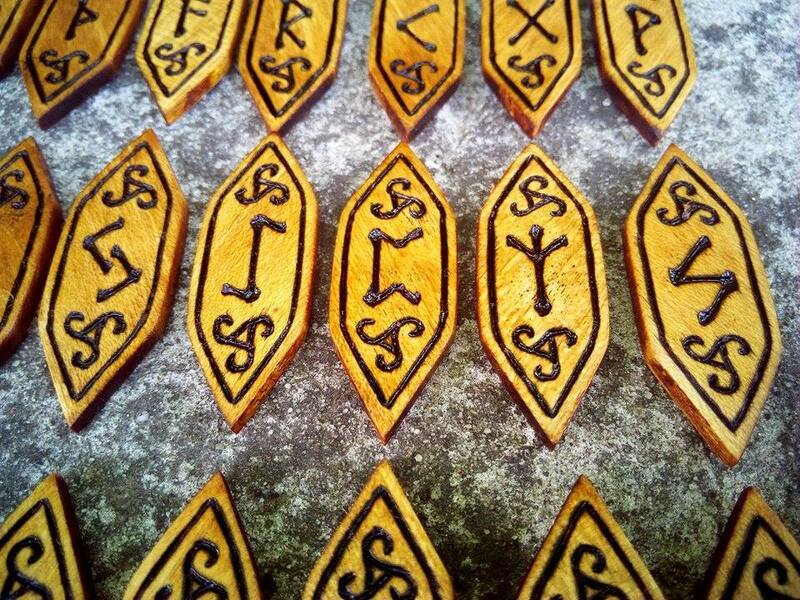 However, in the intervening years since then, I have come to study runes, and the most important thing I have learned is that runes aren’t just an alphabet system; each rune has an energy and spirit of its own. And as any rune-worker can tell you: working with the runes is to work with the layers of spiritual presence and power held by each rune. One of the meanings of the word ‘rune’ is ‘secret’ – so one might begin to see why it is sometimes said that the runes themselves reveal their secrets as one works with them. I’m sure you’ve heard it said that words are important because words are powerful. Their power comes from the ability of words to make our thoughts manifest. 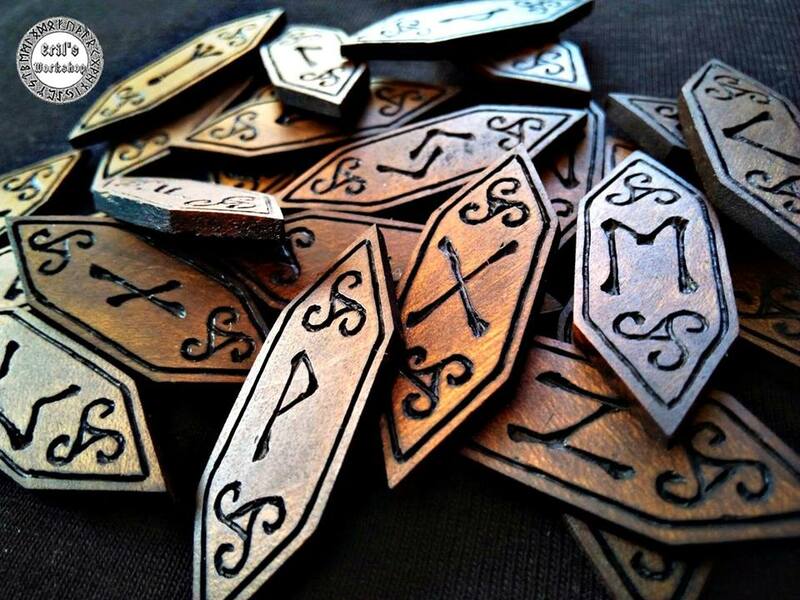 Now imagine if you would how this concept operates regarding runes: if each rune has its own layers of spiritual connection and meaning, therefore the power of several runes can be created in the formation of words. Now, consider the power of names. Names are powerful in the sense that a name is a personal word-thing. With this in mind, let’s consider the runes of Loki’s name. Laguz is the flow of Water. Laguz is the flow of Wyrd – the pools and the depths. Laguz is forward progress that seeks the cracks in the obstacles and blockages. Laguz is a paradox just as water is: like water, Laguz represents a balm that can soothe and strengthen and Laguz is the force that can threaten and overwhelm all that is within its path. As a part of Loki’s name, Laguz is the representation of energetic flow, as the energetic forces within, the essence of the subconscious mind; intuitive thought and emotion. Like Loki Himself, Laguz represents a shapeshifting nature, as water is shapeless, formless, taking the shape of its container, and yet it seeks its own path; it can be blocked by an obstacle or it can simply flow around it, much like Loki’s ever-changing energy. Laguz is a rune that embodies a dual-nature, much like Loki’s: Laguz is an energetic force much like the ocean; a force that can be calm and full of provision and promise, or a force can overwhelm and destroy. And finally, Laguz is a rune of awareness of what lies beneath the surface, a rune of knowledge and psychic ability. On Saturday night, my family and I attended a lovely wedding held on a beach in St. Petersberg, FL. We arrived a bit early, so to pass the time before the ceremony began, we looked for shells on the beach. Almost immediately, my husband V found this shell, and thought to save it for me, as he pointed out that there was a rune on it. At first glance, V saw Sowilo. When my son K looked at it, he thought it was closer to Kenaz. 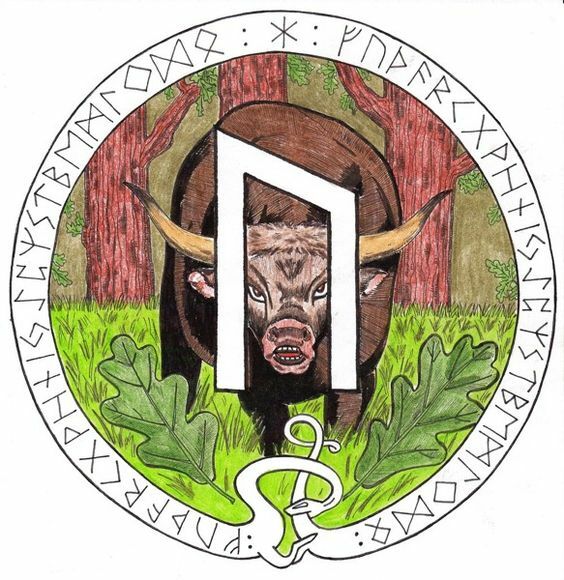 I thought that Othala was rather fitting, as we were attending a wedding, and Othala strikes me as a rune of family and heritage, of community and ancestral/spiritual wealth. 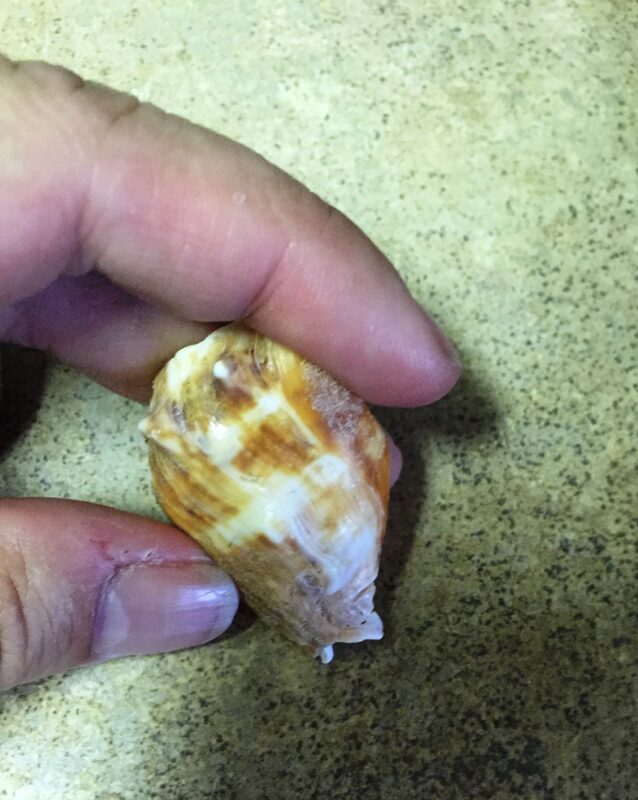 It was a pleasant and surprising thing, and upon arriving home, I posted a picture of the shell, asking others what rune they saw. Beginning on Wednesday 31 August until Friday 9 September, I did Dagulf Loptson’s 9 day ritual, Breaking Loki’s Bonds. I spent Tuesday collecting the supplies. I bought a new red 8-hour candle, three white 4-hour candles, a bottle of Jameson Irish whiskey, and a thick red double-sided satin ribbon. The other things needed – a fire-proof container, a Sharpie pen, a large needle for carving, and sharps/lancets – were items that I thankfully had on hand. 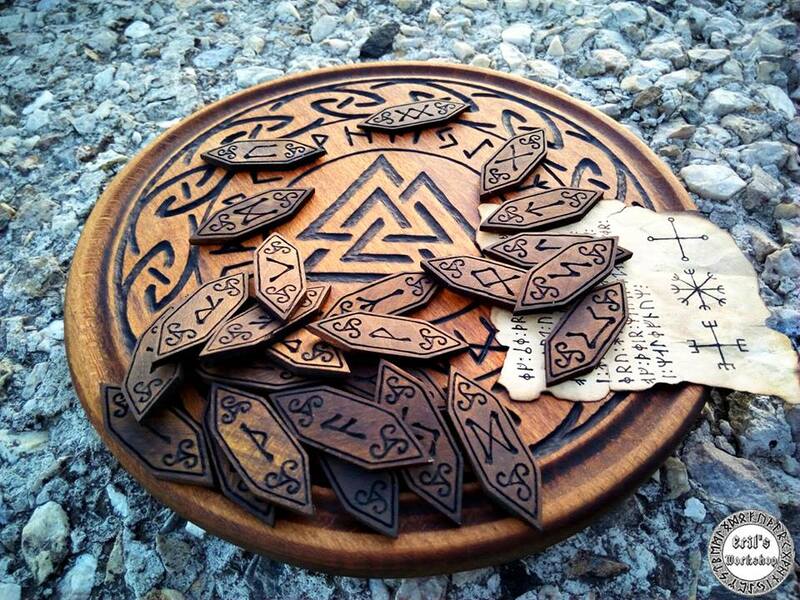 As well, this ritual, as it is written, involves a lot of rune writing/carving, so be aware of the runes. 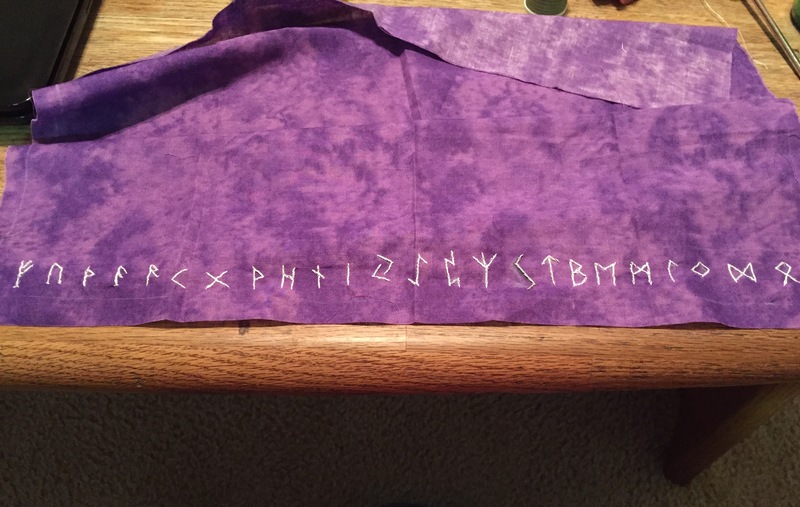 While I don’t consider myself a rune-master by any means, I am familiar with runes enough that I was able to spell out what I needed to. You will be writing in runes on days 2-7. The first meditation concerns asking. On Wednesday night, I approached Loki, and invited Him to aid me in transforming my life. By the way, I am terrible at guided meditations. While I’ve no doubt a vivid imagination, I have especial difficulty in visualizing if I have to jump between reading a text and visualizing the effect, so I spent a good half-hour recording myself reading the text aloud so I could set the visuals of the first meditation in my mind that first night. Though I feared that the first night would be excruciatingly intense, in retrospect, the first night was the easiest night of all. And just after I finished the first meditation, I went to bed. And just before I dropped off to sleep, in crazy-town (commonly referred to as my head post-ritual), I heard my name called out (loudly!) twice. I couldn’t figure out if it was coming from inside or out. Are you ready to claim responsibility for yourself and the fruit of your own actions? Are you ready to see yourself as you truly are? Sigyn: Look in the mirror. What do you see? Loki: Who do you have bound here? The one pinned against the wall, disassociating, feeling humiliated. The one who is strong and creative who hides her light, dulls her shine, full of fear, feeling defeated. The one who waits in the dark. The one who cries. The one who has lost hope. The one who was trapped by duty, trying to fill the void that did not originate in her/with her. This realization – and those visuals – unhinged me to a great degree, but in retrospect, I should not have been surprised: I am the one who is holding myself back. The whiskey represents the hidden ‘poison’ as it were, that is staining my life. This is the truth I am hiding. What are your fetters made of? I saw that the other Heather *is* bound in fetters. Somehow I sensed that they were made of iron. This is the strength of fear, the fear that holds in place, fear that seems insurmountable. Also anger, despair, and hunger for freedom/understanding, but fear mostly. So I wrote ‘Fear made of iron’ in runes on the red ribbon. Who holds the bowl for you? Who are your allies? Today, I see the box – with 9 locks! – where the weapon Lævateinn is kept. K is my first ally: K.
K has always been my first ally. Young and strong and full of love, K is the key and I am the door. I misread the ritual script, and I thought all 3 allies would show today. So, after K, I immediately saw my father and then, I saw Loki. I carved all three candles – easily enough – but then I had trouble drawing blood from my fingers. I hacked up first two fingers before realizing my left ring finger (finger I wear Loki’s ring) bleeds rather well. So I blooded and galdr’d (spoke-sung aloud the rune names) for all three candles. K’s initials. My father’s initials. Loki. I unlocked the first three locks. I woke up this morning, and there were spots of blood all over my pillowcase. Last night, I realized that I had made a mistake. So I burned off the two rune sets off the two candles #2 (my father) and #3 (Loki) to re-set. Who is your second ally? And I Immediately saw a Fox. Bright green eyes and surreal red fur. I could not shake that image from my sight. I quickly realized that Fox is cunning and quick, and upon a closer look, I saw that this Fox wore three colors in the form of three threads twisted red, yellow and green, that twined down its back and around and around its tail. The Fox had threads in its fur that are red and yellow and green. As Fox licked my face, I asked if it would lead me out of the dark cave when it was time. And Fox nodded. 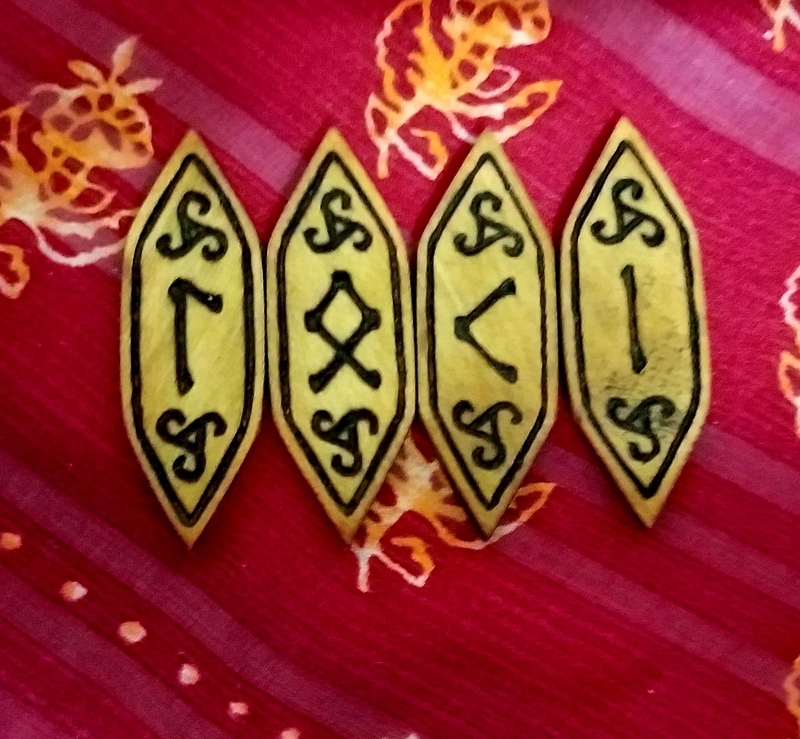 As I prepared to carve the runes, I realized something important. Do you know there is no letter X in runes? I learned that today. I will lead you through the darkness – my eyes are light in the dark. Trust me. I am the spirit of Wisdom and Cunning that you must trust to help you. I am the Pathfinder! I will show the way, the secret way…soon enough. And with that, Fox turned and ran off, making tiny silent tracks soft across the snowy field. I unlocked the second set of three locks. Who is your third ally? I spent quite some time in intensely deep meditation upon my 3rd ally. It took some negotiation before the 3rd ally would finally come forward. Then I heard someone mention that it should be (my older son) by name. (I heard his name). Then I saw a woman cloaked in burnt red robes. And then I saw an enormous raptor – a hawk – who was somehow Her too. It seemed that my third ally is the far-seeing Hawk-woman. She then told me that She can see far above and, like Fox, She would be another guide through the darkness. She is strength and perseverance in the face of battle. So I carved the runes to spell ‘Hawk’ on the third white candle, and I galdred them. Thank you, K for your assistance. Thank you Fox, for Your cunning. Thank you, K for your faith. Thank You Loki for Your help. Thank You Freya for Your strength. Thank you, K for your alliance. Thank You my Beloved for Your Love. Thank You My Lady for Your Guidance. I unlocked the final set of three locks. The ritual then directed that the three candles should be allowed to burn to socket. Oddly enough, though the candles were labeled as having a 4 hour burn time, the ritual lasted about one half hour, all told. What is the source of your liberation? This day’s meditation had me opening the – now unlocked – box where Lævateinn is kept. A word, concept or image will be revealed to me as appearing on the surface of the blade. I chanted to Loptr to reveal to me the source of my liberation. Suddenly, an image of a(n anatomically correct) heart flashed through my mind. Suddenly, a thought flowed through my mind: Do you love her? Suddenly I looked down at the blade and saw the word: Love. Love was the source of my liberation. My love for that other self, that other Heathir, would free her from her bonds. So I wrote the word ‘Love’ in Futhark runes on both sides of the blade and blooded each rune as I galdr’d their names. Tonight, it was difficult to visualize the cave. I couldn’t see Them, but I could sense the sword in my hand. It is rather heavy. I feared that I would not be able to lift it high enough and get a good angle to cut His bonds. My mind gets so hung up on such particular details, I suppose. I started to think about what His bonds were made of vs. my own. Earlier in the meditations, He had said that guilt kept Him bound – the guilt of not having been able to protect His children. And I thought of myself, and how interesting to think that my fear was the means that I had been holding bound that other Heathir within myself. Suddenly it made a weird kind of connection and I thought about how fear was at the basis of a lot of things in my situation, in my world – guilt and fear. Fear of change, fear of the unknown, fear of the inevitable future. And the choices that are made because of the fear of loss. And for a moment I could see His eyes and the weariness and pain in them, and I raised the sword. I cut the bonds at His shoulders, and thought about fear of not being accepted, of not being loved or understood. (The fear that leads to hatred/judgment and misunderstanding) Fear of the past. I cut the bonds at His pelvis and thought about fear of judgment, fear of failure, fear of pain. And I found myself sobbing at the difficulty, as I could see the face of that little girl, that other Heathir, my child-self, sobbing too. I am tired of being afraid, I am terrified of being trapped here, her eyes seemed to plead…. How I used to think that love dies in the presence of fear, but here, love was the means to overcome fear. Then it was time to cut away my bonds; to cut the ribbon I had made. I momentarily entertained the fear that my own actual blade would be too dull to cut through the ribbon, but it flawlessly sliced through the fabric, into three pieces. Then, as clear as day, I saw the vision of the other Heathir, bound there before my eyes…and just as it was with Loki, it took three strokes. I see you. I recognize you. I know you. I value you. You are free. I am free. You have not failed. You are free. There is no need to punish yourself anymore. There is no need to fear happiness or freedom or change. And I allowed myself to cry and feel and know that I would never deny that – or her – again. Today He is free and so am I. Today is about recognizing Him and recognizing myself. As well, the bottle I put aside -that signifies the venom of the snake becoming the medicine – that was a powerful metaphor. We are going to drink it in celebration. They had a personal message for me, and I realized that I have traveled a long road to Them. Their message for me was profound and personal and Their words meant everything to me. I was almost in tears all over again – tears of catharsis, tears of release. This was such a cathartic and necessary ritual for me. Wax was everywhere. The scent of apple cinnamon candles, whiskey and burnt ribbon permeate my altar space, even now many hours later. But it is done. And it was definitely worth doing. And I feel lighter in spirit and more connected to my Gods. *The second meditation was so intense and vivid that I dedicated a post to just the specific visuals here. I startled – and I looked up to see K is standing there, standing just within the doorway to my meditation area. I didn’t even hear K knock. ‘I’m going to bed’ he says. OK — but make it quick! And that’s why K was there. *** The ribbon – being satin and likely polyester – didn’t burn very well. But again, I sat with it but it took a long time – with several re-lightings – for it to burn to ash. But 20 long minutes later, it was done. I hope I did it right. What a perfectionist I am!